In a hurry I rushed to Golden Gate bridge during magic hour to photograph the bridge. San Francisco has many epic locations for photography. For example, city hall is quite impressive. There are bay cruises that can take to get different angles of the shoreline waterfront. Epic photography locations. 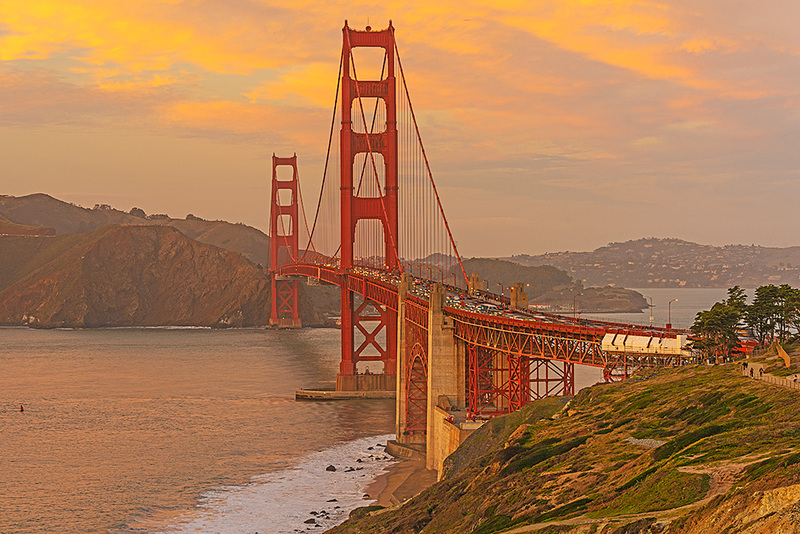 You can purchase the Sunset photo of San Francisco Golden Gate Bridge on my Alamy.com stock photography page. Soon after the hill fire blocked out the sun the Woolsey fire crept into Thousand Oaks and Agoura Hills overnight.During the late night 75000 residents in Thousand Oaks, Westlake Village, Agoura Hills, and Calabassas were evacuated and 13 structured were charred. With the fast blowing winds the fire soon jumped the 101 freeway and began advancing towards Malibu Lake. The famous movie set Paramount Ranch where movies have been filmed since the 1920’s had burned to the ground. WITHIN a few hours 30000 more people were forced to evacuate in the city of Malibu. Many more million dollar estates were burned to the ground in Malibu as the fire advanced through the canyons to Pacific Coast Highway. This fire is only at about 15 percent contained. The terrain is very rugged throughout the canyons with alot of dry brush, Oak Trees and Manzanita bushes for the fire to consume. The relentless Santa Ana winds have made this blaze nearly impossible for the firefighters to extinguish. The fire began at the old Rockadyne facility in the Simi Valley Hills and overnight jumped the 101 freeway and quickly made it’s presence known in Malibu. Residents are now returning to their smoke damaged homes in Agoura Hills, Westlake Village, Thousand Oaks, and Malibu. These are the worst fires in California History. It is time for the Power Companies to bury their electrical lines no more expensive devastating excuses. For update information you should contact the fire department of the sheriffs department in either Ventura County or Los Angeles county.